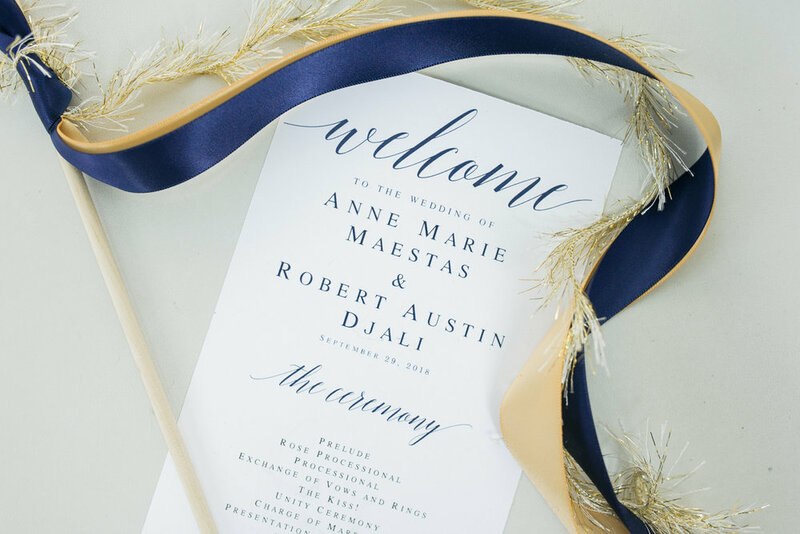 Annie & Austin’s wedding day was nothing short of magical. The flowers were stunning, Annie’s dress was timeless, and Austin never stopped smiling. 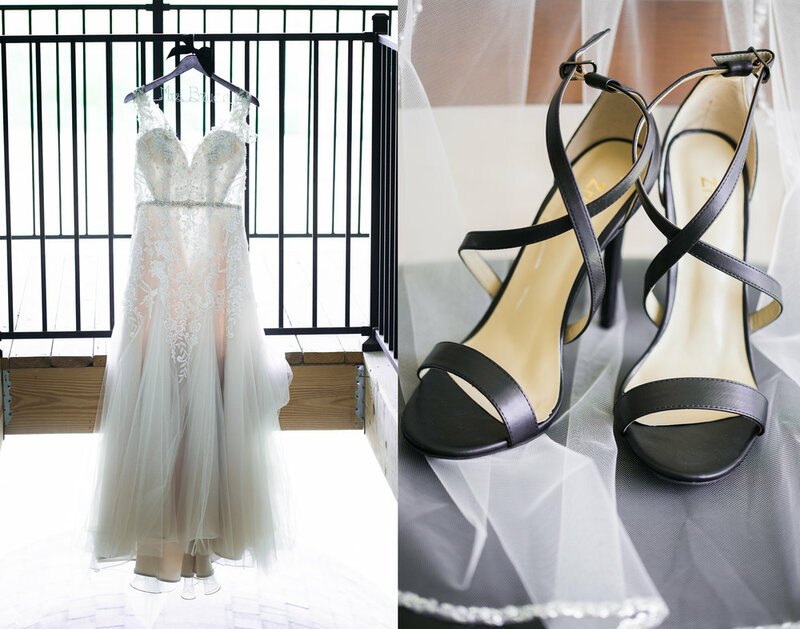 The Chapel at New Town is full of beautiful airy light that is every photographer’s dream! I had never shot a wedding here before and I seriously can’t wait to shoot more. The colors around New Town this time of year cast an abundance of beautiful fall colors all around them. New Town really is a gorgeous small town with a community that is like no other. 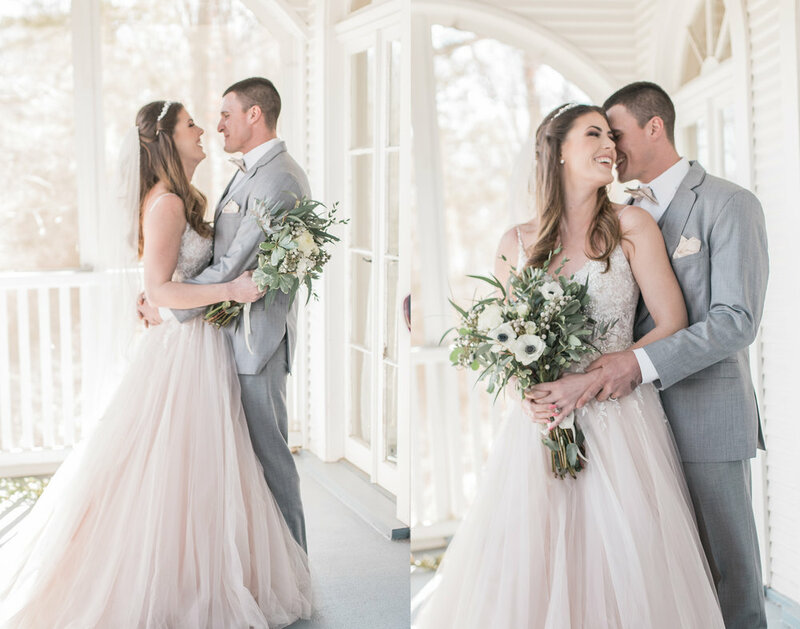 Annie was nervous before walking down the aisle, but as soon as she saw Austin, her smile grew and the whole chapel was in awe, I mean…could she be more stunning?? These also had a party like no other with Annie’s brother’s band rocking the event tent! 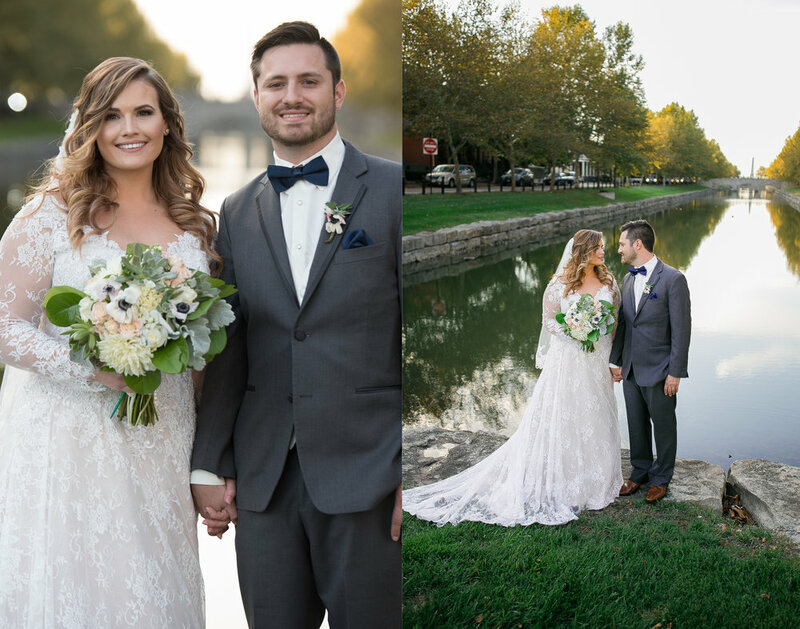 Melanie & Corey had gorgeous weather at Quail Ridge Park in Wentzville where they said their "I do's". 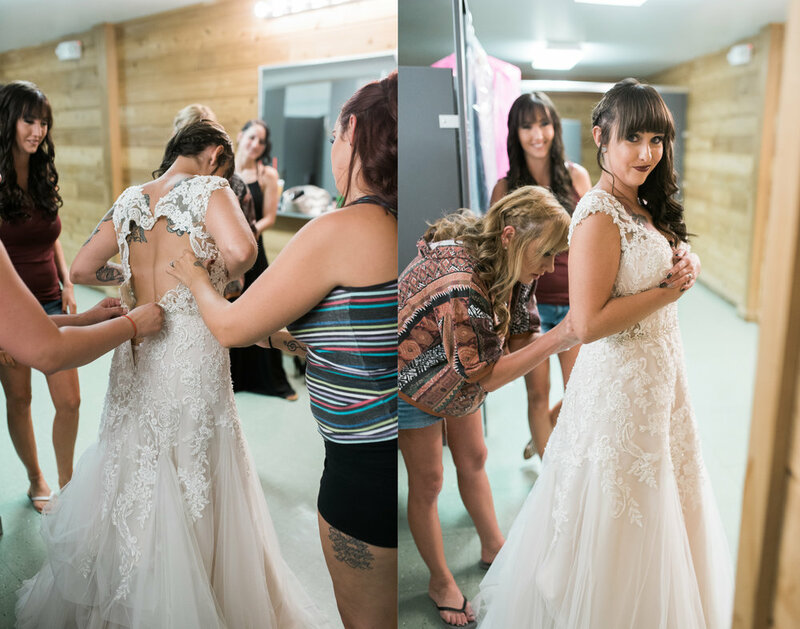 Melanie's gorgeous wedding gown that displayed her beautiful tattoo artwork was stunning with her side swoop hair do. Every detail was excellently executed and really made her look complete. The black and maroon colors complimenting everything about Melanie. 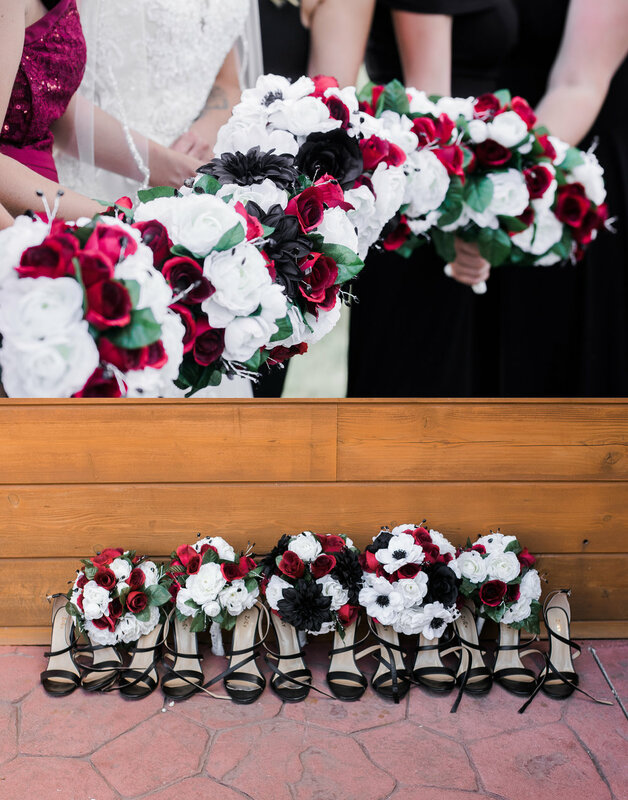 I couldn't believe those were silk flowers! I learned very quickly that the Groomsmen don't take each other too seriously when all together and they definitely love to joke. We had such a great time taking pictures and getting to learn a little bit about his friendship with each one of them. 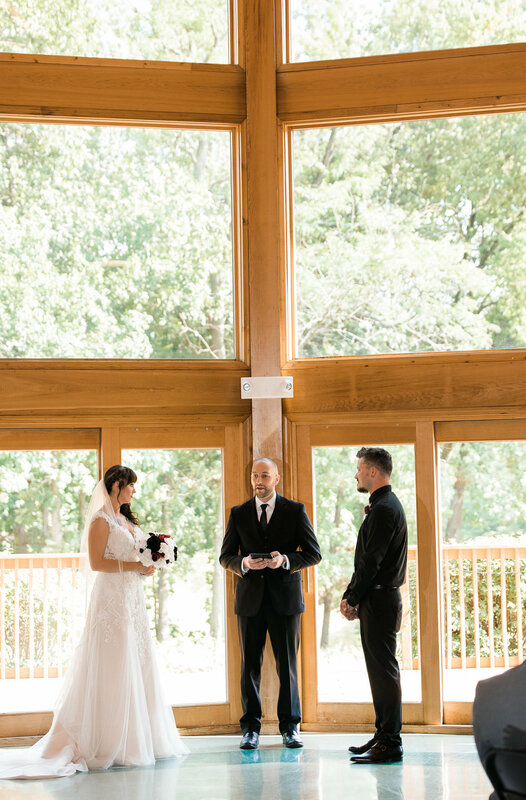 As Corey watched Melanie walk down the aisle he had to look to the sky to keep the tears from falling, which is perfection in the eyes of a photographer. 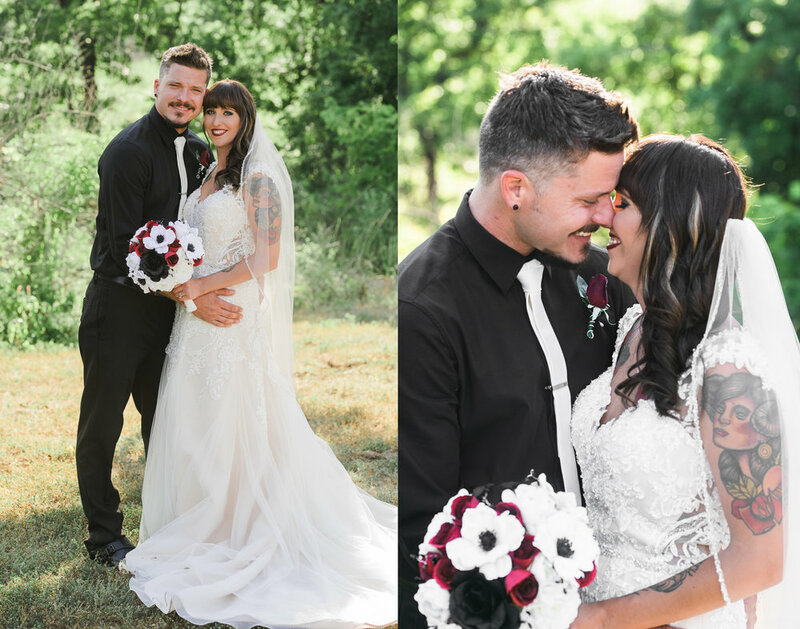 Watching these two say "I do" with their family and closest friends really made me smile. 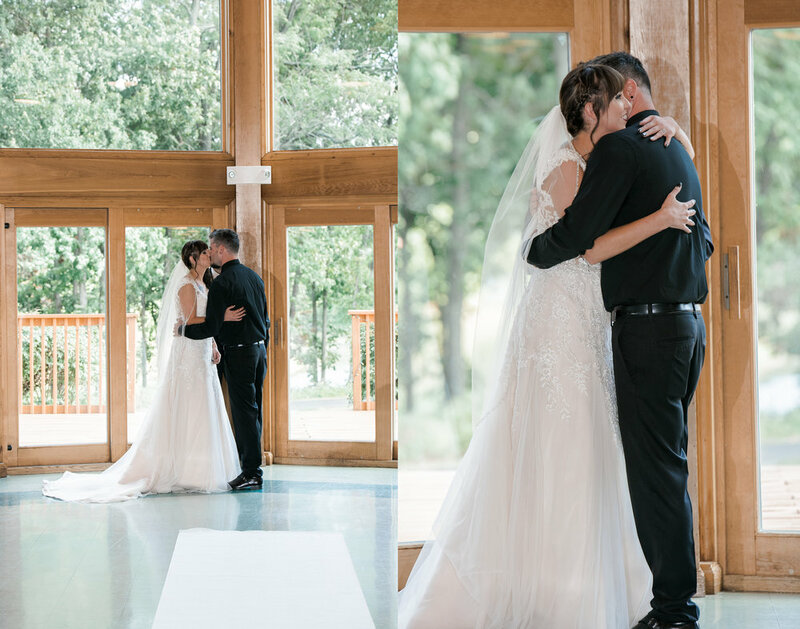 The Lodge at Quail Ridge proved to be a perfect setting with wall to ceiling windows the over looked a pond and lush greenery. I can't wait to shoot more weddings there in 2019. The ukulele serenading Uncle's was probably my favorite part! 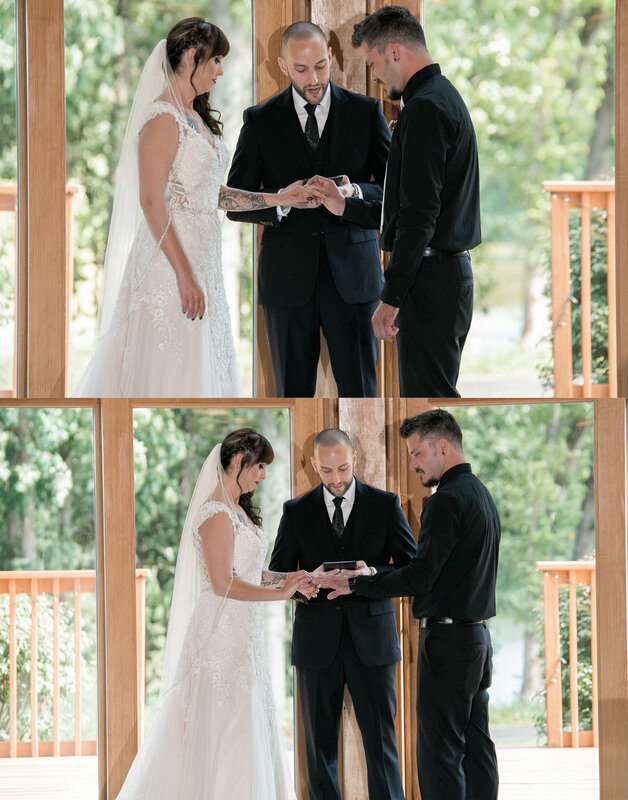 Thank you Melanie and Corey for asking me to be there to capture your wedding day. I loved spending the day with you and your family and friends. I am excited to see where this next journey in life takes you! 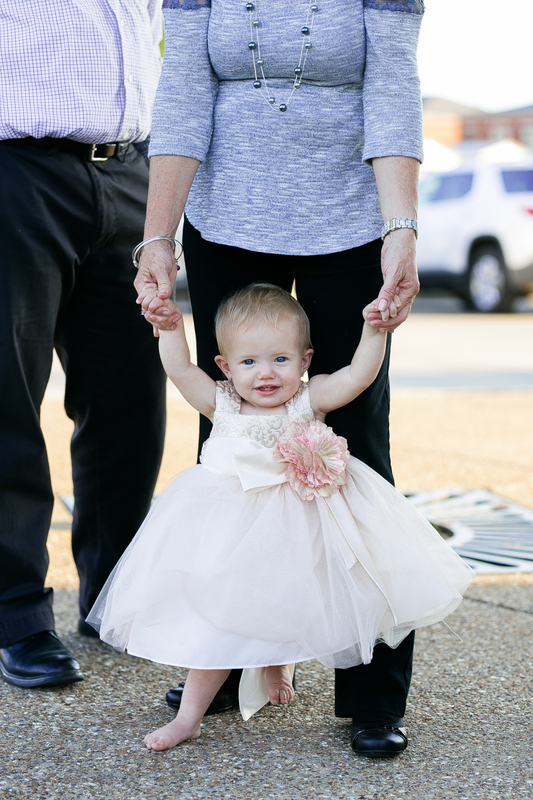 Historic Main Street in St. Charles Missouri is always a beautiful stage for pictures. Dee & Carl illuminated it even more during their session. 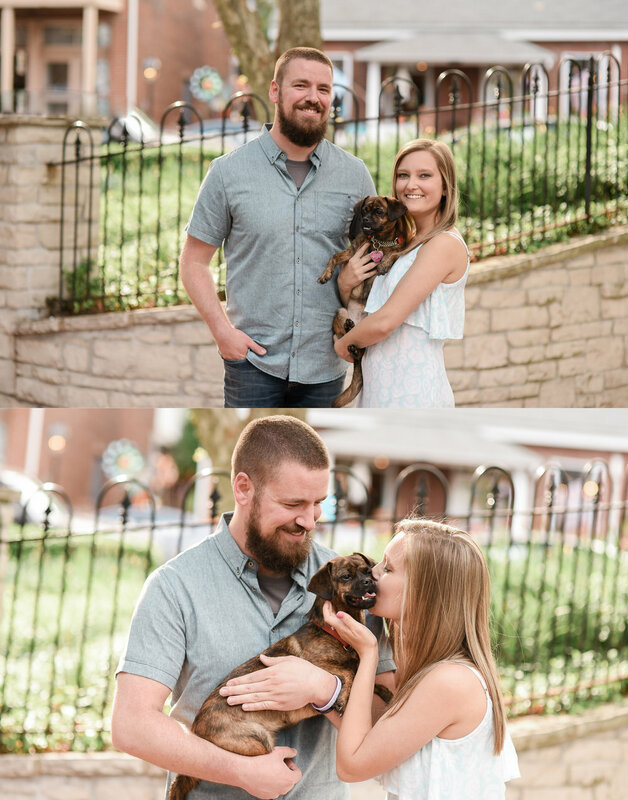 They way they make each other laugh and care for their sweet Pup made this session one to remember. I am really excited to hear the details of their big day, but in the mean time they are really enjoying traveling and just being engaged. Makes my heart melt! I hope you love this session as much as I did! Especially the delicious sweet treat at the end! Riverside Sweets on Main Street is a must stop if you are ever in the area. Jen messaged me through a mutual friend in regards to shooting their wedding day. Their wedding day was the first time I met them or worked with them. Upon finally getting to meet them I was instantly put at ease. Their smiles were HUGE the entire day, they went with the ultimate flow of a crazy wedding day with grace and Jen even stated at one point, "Today is already amazing, because I am marrying this guy". Does it get any better than that? 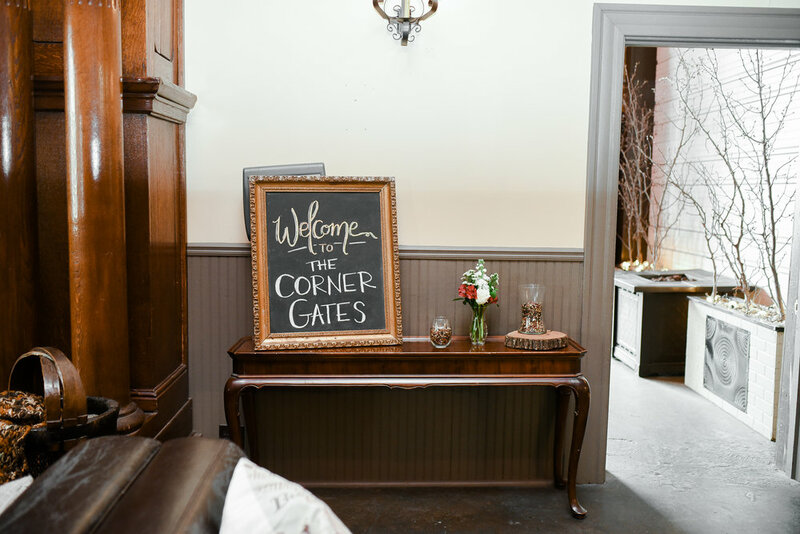 The Corner Gates is a perfect hidden event room off Cherokee in St. Louis Mo. The intimate feel as soon as you walk in really sets the pace for a romantic wedding. I have to confess when I go to wedding I always seem to remember the meal, and the food was outstanding! I know that Jen & Mike are going to celebrate a great life together and I really can't wait to see what this life brings them. The past two years I have made it a goal in my business to attend some sort of class, workshop, or continuing education, as well as meet in groups of other photographers just to have fun and practice. I know how important it is to try new things and inspire yourself to create new memorable pieces of art for your clients. This year at the beginning of March I attend The Flourish workshop in beautiful St. James MO with Ashley Wills LLC. As with most things I was a little nervous going in. What's more intimidating that a room full of not only your peers but also your potential competition?? Instead though, from the moment I stepped foot into the Will's beautiful home I felt welcome. I felt that we were all there to not only learn from Ashley & Noah, but from each other. I felt we were there to encourage and lift each other up. Each one of these amazing woman are all on a different journey, but with the same purpose. To share your artwork and passion with the rest of us. It was just an amazing weekend, sharing meals, knowledge, and what we love about this industry. 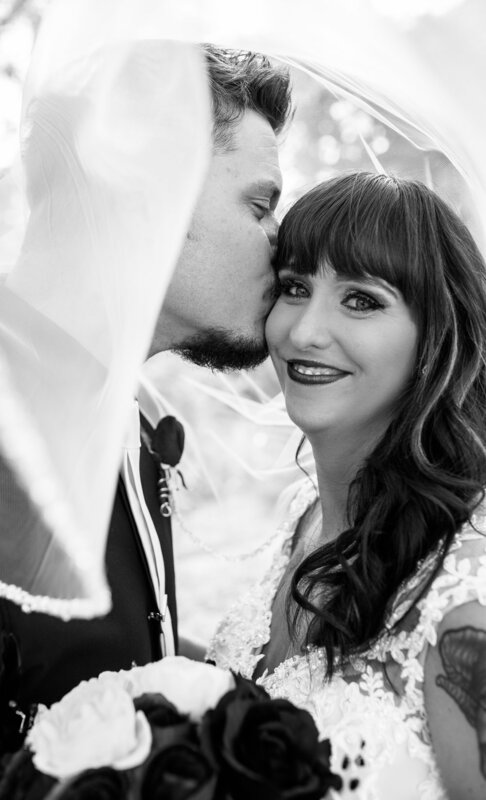 On the first day of the workshop Ashley and guest speaker Tiffany Katka put together the most beautiful wedding styled shoot at Wildwood Springs Lodge. This location was a perfect overlook of the rolling hills in Missouri. 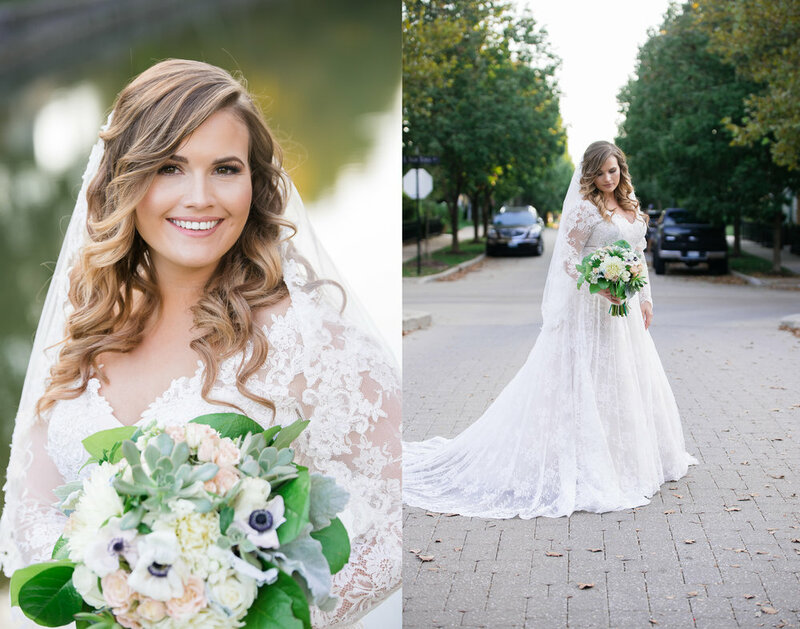 Ashley had so many great tips on posing, positioning for great lighting, and remember the tiny details like florals to make the image complete. 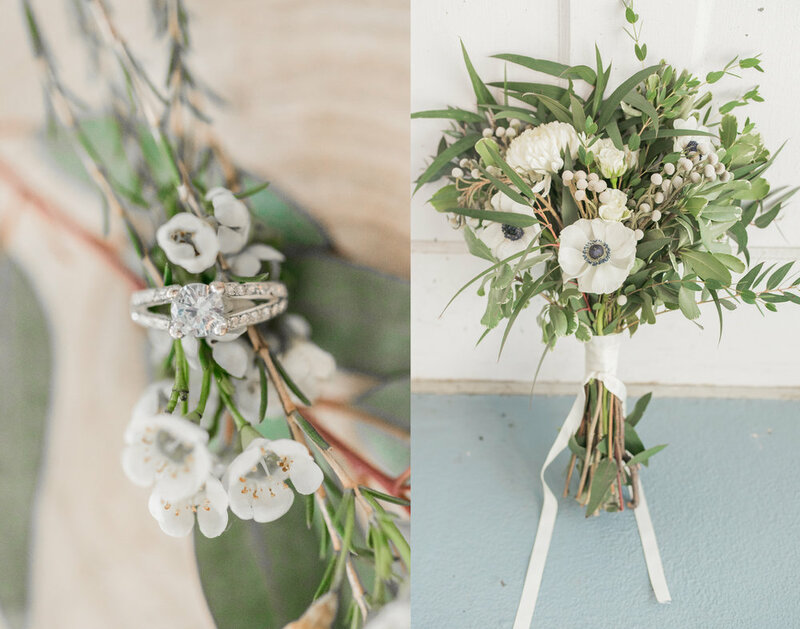 Not only is Ashley a wedding photographer but she does a small amount of florals too if it is something her bride needs. Ashley did a beautiful job complimenting the colors of the venue to the florals to really make for great pictures to learn off of. 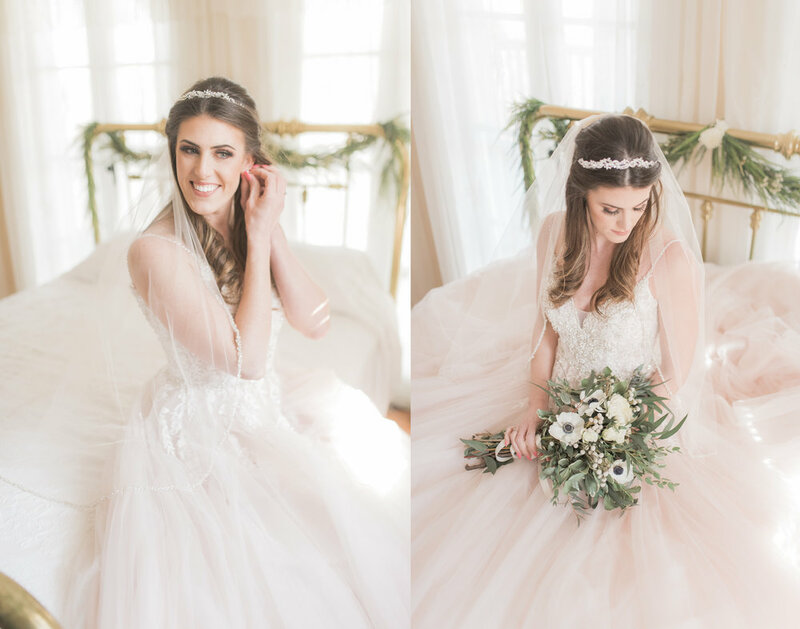 Let's take a second peek at the gorgeous bridal gown from Mimi's Bridal in St. James Mo. The way the light hit the skirt made it glow with that gorgeous blush undertone. It was so fun to watch her dance in! I really hope one of my bride's this season has a gorgeous flowy dress like this one! I couldn't believe how many images I walked away with! Everything about this shoot was just so gorgeous. It is essential in our line of business to slow down and learn what stems your creativity and spark it again. 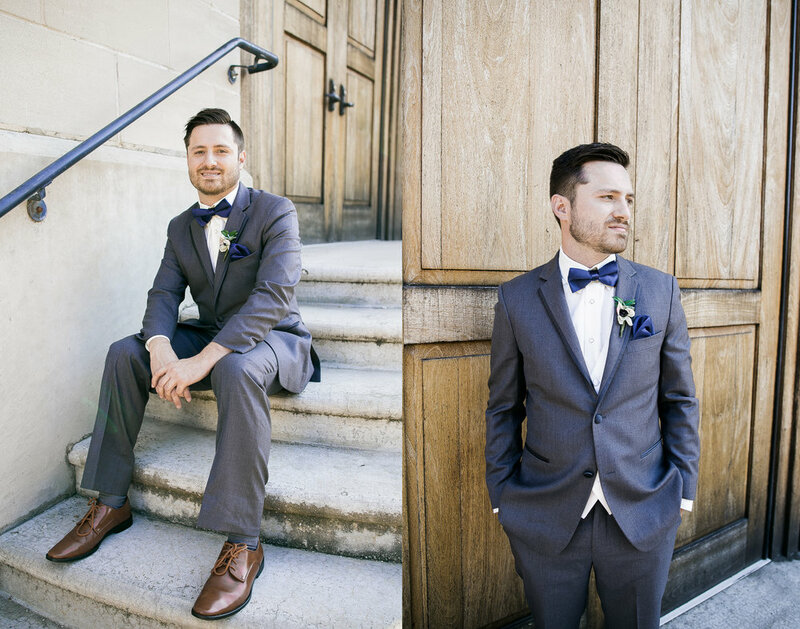 Here is some of my favorites from the whole shoot. Saturday & Sunday we were blessed with some of the best cafe style food from The Market Place Cafe in St. James MO. For Saturday's lunch we were served fresh cut turkey sandwiches and the best baked potato soup I have ever had. They delivered it right too us fresh and set it up so we could easily make our sandwiches! If you are ever there or just passing through, you should stop in for lunch or dinner! I really enjoyed my weekend at The Flourish workshop. I came back home inspired to turn my business into what I saw it as, what I knew it could be. If you are a photographer looking to start or build stronger skills, look into the Ashley Wills Workshops. 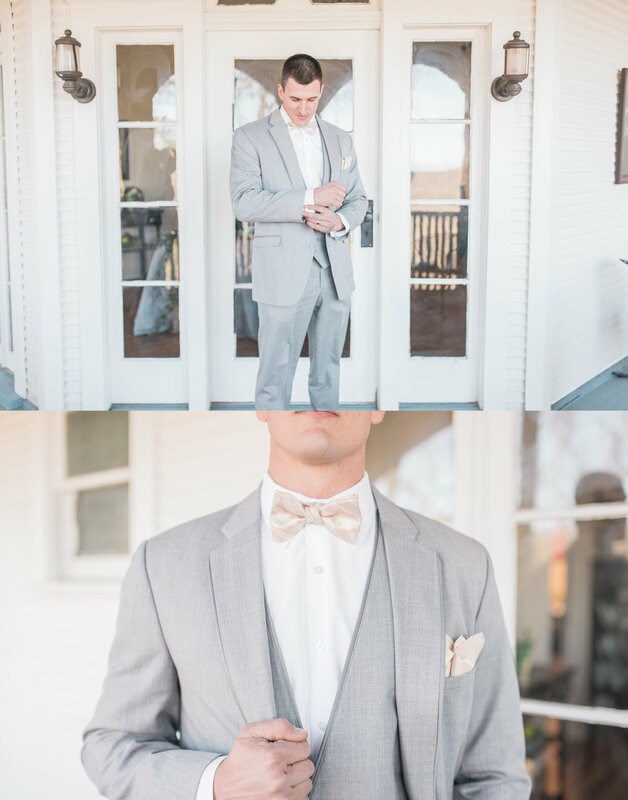 You will instantly know it was the right choice as soon as Ashley's huge smile & Noah in his bowtie, open the door and welcome you into their home. Ashley loves to give gifts like me! We were given so many cute things to remember the things we were taught. Below are all of the amazing take aways we received from some pretty amazing businesses. 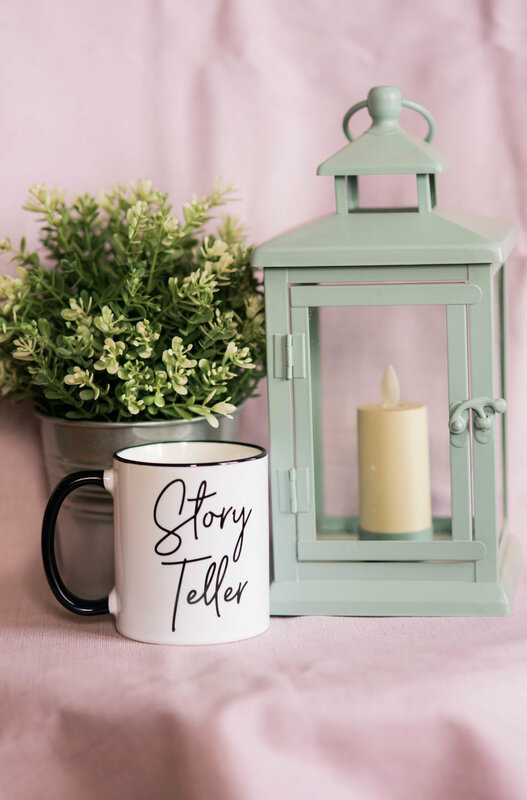 You can find the adorable mugs at Mugsby. We had lots of fun taking pictures of these which you can check on on Ashley Wills Facebook page. The adorable candle is from ModParty and they have unique and adorable wedding favors for your wedding party! Teals Prairie Engravers made the notebook etched with Flourish workshop on it. They have great options for personalized gifts. Last but not least, the perfect checklist notebook was from Paper Rocket Studios. 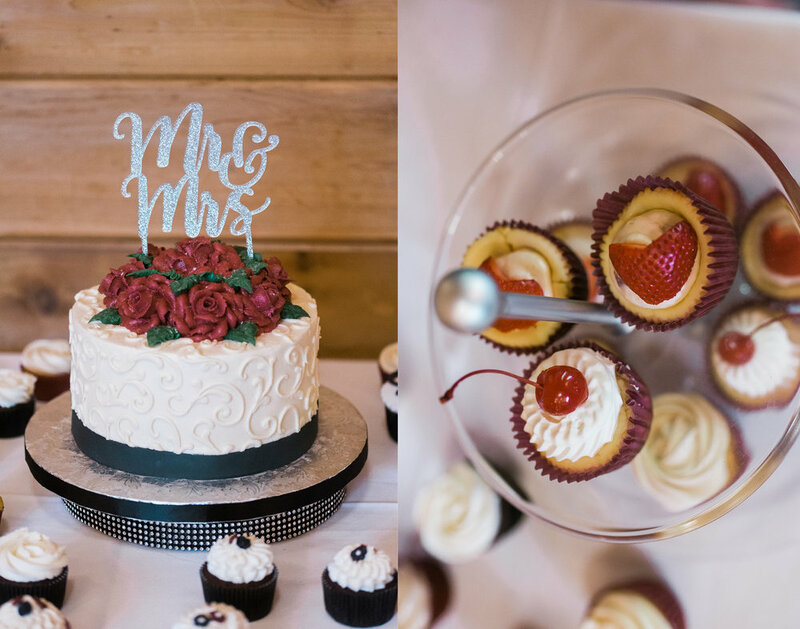 I am so grateful I was able to also make connections with other great businesses that could be an asset to one of my brides while she is planning her wedding! 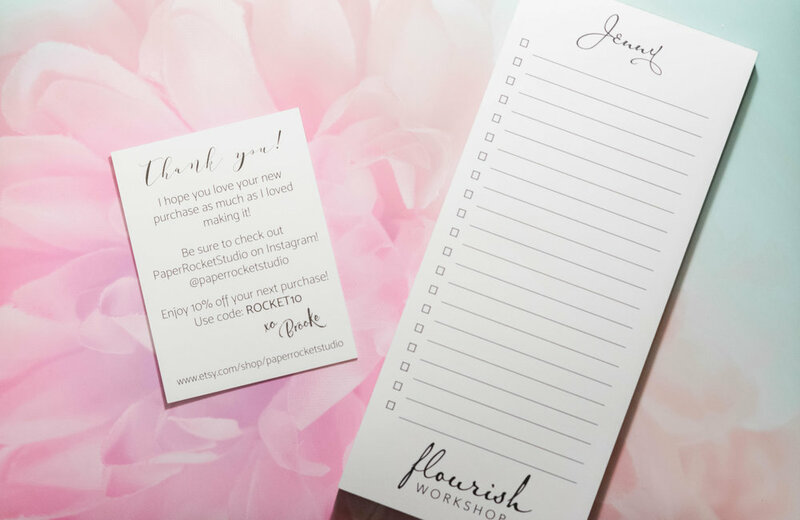 So many wonderful things came from my weekend at The Flourish workshop. I am looking into another one they offer in July! Come with me! If you would like any information on any of the vendors, click their names and it will link you directly to their websites or Etsy Shops!